BMW i3 owners have an interesting competition amongst themselves and that’s to see who gets the most flat tires. 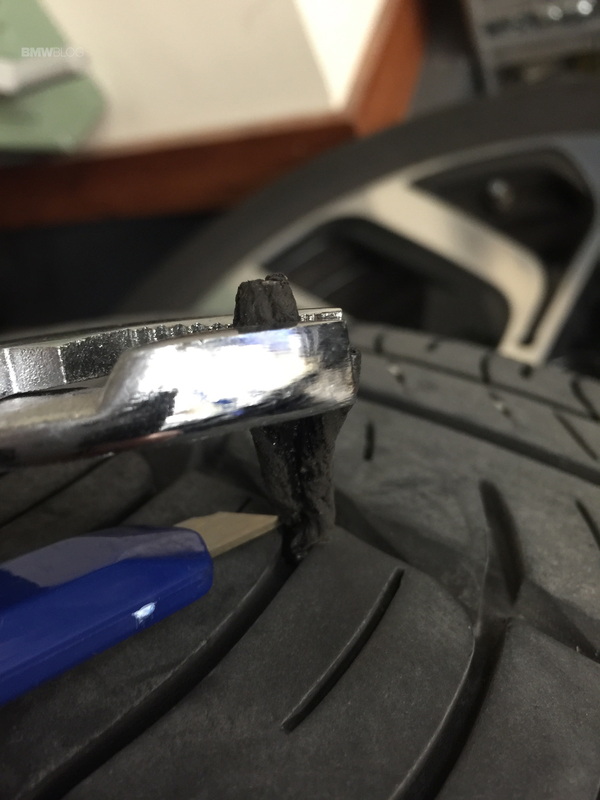 For some reason, despite the i3’s very narrow tires – 155mm to 175mm – the damn little things have an unusual attraction to sharp objects on the road. 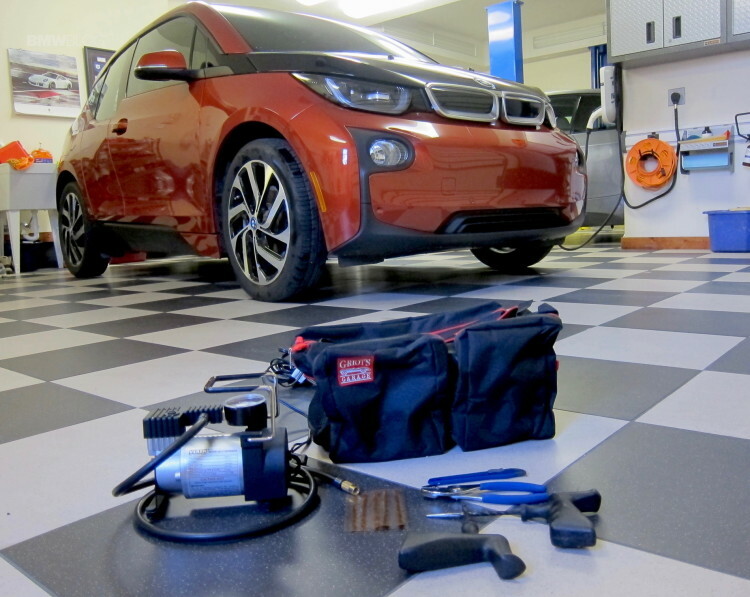 This brings up interesting challenges for us – the i3 owners – because the little BMW electric car does not have a spare tire. Though it does come with a can of “fix a flat” and a small underpowered air compressor, therefore many flats have resulted in a tow truck to the dealer. BMWBLOG holds the record for the quickest flat after purchase at Day 2 of ownership and less than 150 miles. 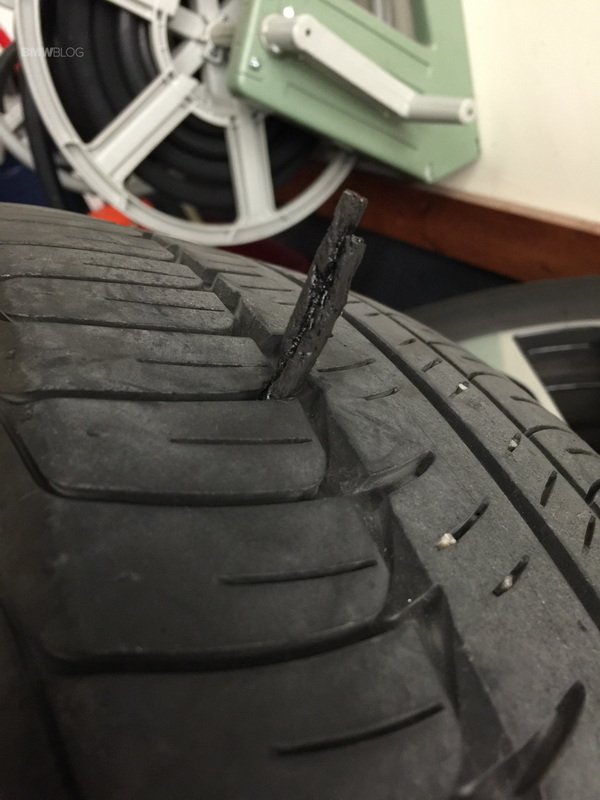 Our first was caused by a 4-inch bolt that killed the tire. And I do mean killed it. It was too big of a hole to patch or plug. It costs us $148 for a new tire from the dealer along with install mount, balance and tax, ended up totaling $211.78. Happily we made it about 14,000 more miles before we had our second flat. 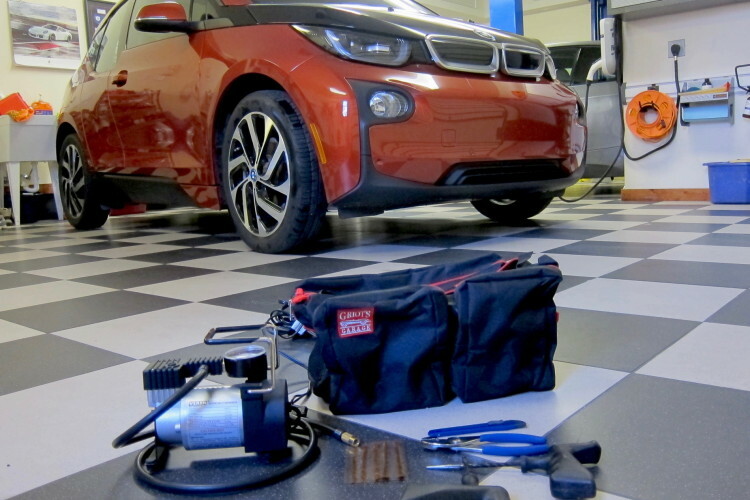 Enter one of my favorite things I’ve purchased for my garage – Griot Garage’s Tire Repair Kit. 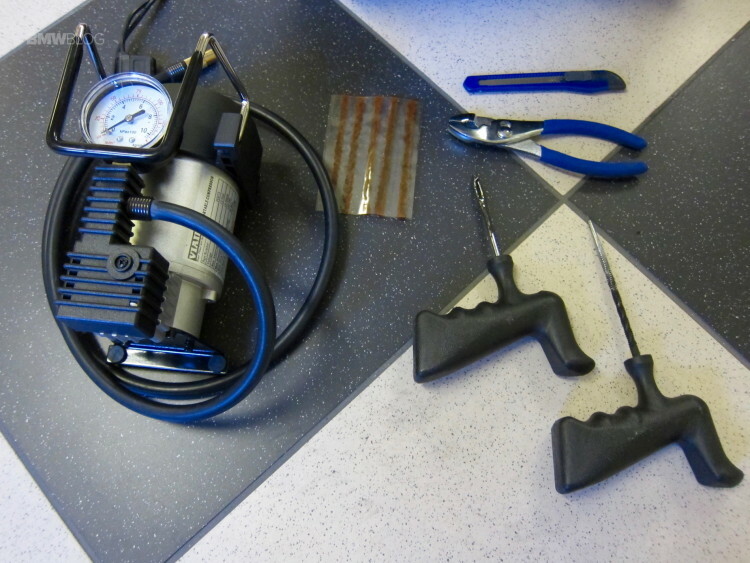 The kit includes a set of tools to remove the offending object from the tire and plug it, as well as a wicked 12-Voit air pump up tires crazy fast by simply plugging the air pump into the cigarette lighter. The whole thing comes with its own small red and black bag to keep it all tidy when not in use. First I removed the wheel from the i3. This way I could get a good grip on the offending screw with the pliers and yank on it. Sure enough, air immediately starts hissing out the hole. Next I grabbed the burr tool which sets a standard diameter for the plug through the tire tread. This tapered rasp does require some force to ream it in and out of the tire. Next, I grabbed a sticky string like plug, put it in the needle like tool and shoved it in. 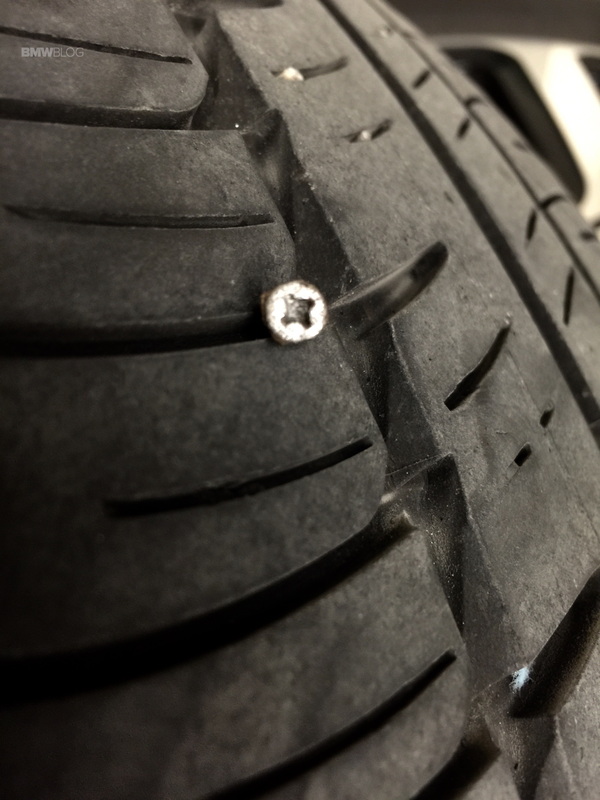 Somehow, it disengages when you are pulling the needle back out of the tire. Trim the extra off the plug that hangs out and fill the tire back up with air. The thing I like about the Griot’s Tire Repair Kit is that the rasp and the needle have huge T-shaped handles instead of a small screwdriver style handle. This T-shaped handle allows you to put a lot more force without killing your hand. Second, thing I like is just how strong the air pump is. 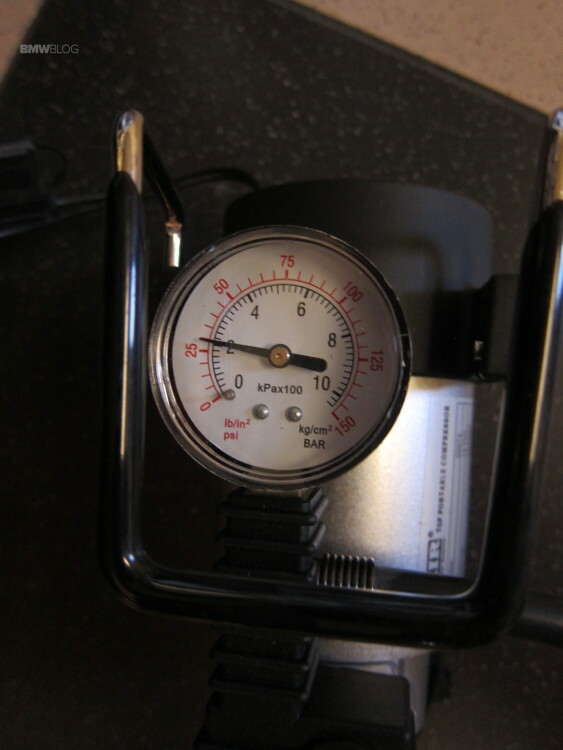 It’s a great pump and one that I take to the race track to be able to adjust air pressures on my E92 M3. It has a pressure gauge on it and screws onto the valve stem so you don’t have to hold the pump while it airs it up. At $83 for the kit, Tire Repair Kit and Pump is one of the most utilized car things I have in my garage and keeps me from having to run to the tire shop to fix simple flats. Lastly, reinstall the wheel and properly torque the wheels down to 140 Nm, 103 lb-ft. The front tires are supposed to be 33 PSI and the rears 41 PSI.